Three-row SUVs are all the rage these days, and not even because people need all those seats—they’re just nice to have. You know what else is all the rage these days? Jeeps. And not because people need the off-road capability—it’s just nice to have. So what better way to give people capability they don’t actually need than to offer a three-row Jeep? Enter the Jeep Yuntu Concept. The number of SUVs you can buy with three rows these days is staggering; many of them are so small, the third row is basically useless for anything but a short jog to the ice cream shop with the grandkids. But alas, crossover buyers want third rows, and that’s obvious when you look at at vehicles like the Nissan Rogue—a compact SUV with seating for seven. How does that make sense? I don’t know. He went on, proving that the Lexus’ choice to forgo a third-row option was a huge mistake by citing the vehicle’s main rivals—the Acura MDX (based on the three-row Honda Pilot) and Infiniti QX60 (based on the three-row Nissan Pathfinder), which all offer seating for seven. A number of vehicles that traditionally only offer two rows, like the upcoming larger Volkswagen Tiguan—are throwing another row in there, because people just want that capability. Who are automakers to deny them? That’s a question we should all be asking Jeep, the brand that specializes in crossovers, and a brand that is doing everything it can to build new products that fill pretty much every gap in the market (and for good reason—the world won’t stop buying Jeeps). I mean, just look at the 2017 Compass; somehow, Jeep has managed to squeeze a vehicle between the small Jeep Renegade and also fairly small Jeep Cherokee. With such a drive to dominate every facet of the SUV market, it’s surprising there’s no three-row Jeep yet. There is now, however, the 2017 Jeep Yuntu Concept, whose images Jeep just released before the unveiling at the Shanghai Motor Show. 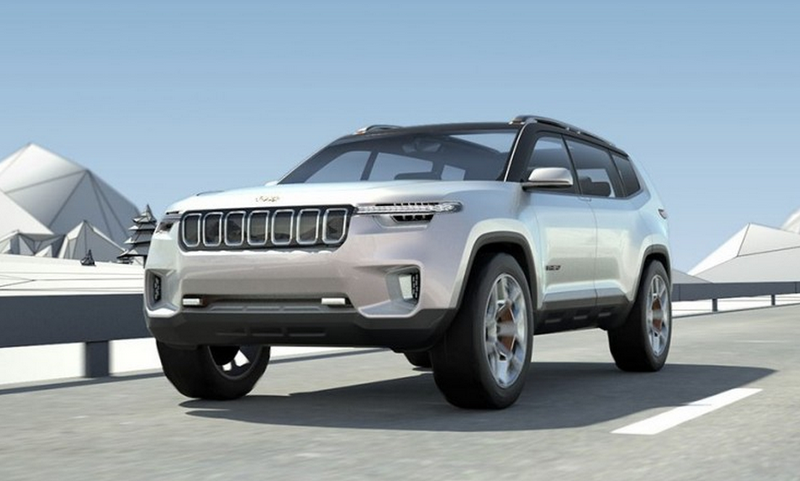 We don’t know a lot about the new Jeep, though Carscoops cites rumors that it will be based on the KL Cherokee, and that it may feature a hybrid powertrain. International Business Times says that hybrid powertrain could be a 3.6-liter plug-in hybrid (similar to the Chrysler Pacifica), and that the vehicle will likely form the basis for a 2018 flagship planned for the Chinese market. But we don’t know if any of that is true; all we know is that it looks like a Jeep Renegade from the rear three-quarter profile (with the belt line that steps up to a thick d-pillar) and like a Grand Cherokee from the front (with the thin headlights flanking the grille at the top. It’s hard to really tell the scale of this Jeep; is it a small seven-passenger Jeep like the Nissan Rogue, or is it a behemoth like the Land Rover Discovery? We’ll hopefully find out more in the coming days. And hopefully there will be a big three-row Jeep coming to our shores, because America has Jeep fever right now. For $10,500, Could This 2006 Jeep Commander Limited Command Your Attention?